The best thing about this list of whole food finger foods is that are they very easy to prepare and some require no preparation at all. In fact, many of the ingredients are already sitting in your fridge, pantry or fruit bowl, ready to be washed, peeled, cut and served. Offering your baby a wide variety of food is incredibly important in the first year of life when he is more likely to accept them. Many of the finger food ideas I see on BLW (Baby Led Weaning) forums are some kind of mixed dishes, like muffins or egg creations with fruit or vegetables mixed in them. I think they are ok to serve from time to time but ultimately we want the baby to get a lot of exposures to individual foods so that he can learn to like them. 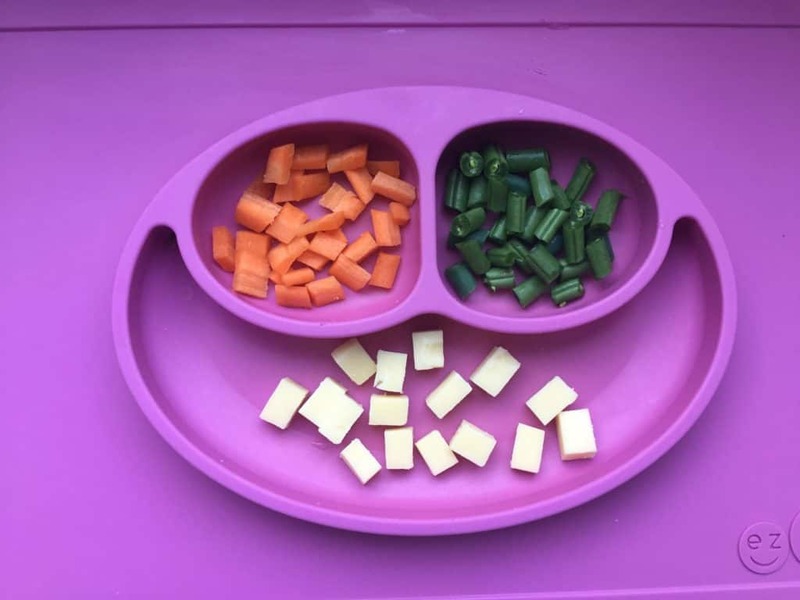 You can read about the pros and cons of Baby Led Weaning here, check if your baby is ready for solids here and find out why I chose a mixed approach to starting solids here. On the list, you will see things like nori, raw baby spinach, raw green onion or artichoke hearts. You may think that they are a strange choice for a baby finger food but in fact they perfectly appropriate and very nutritious. Who says we have to be limited to bananas and avocados? You may be surprised by your baby’s preferences! The best thing you can do to ensure your baby is safe is staying with her at all times when she is eating. Next, avoid choking hazards. I also highly recommend to take a CPR course and/or learn the Heimlich maneuver in a certified first-aid training class. To keep finger foods safe, make sure they pass the “squish test”. Take a piece and press it with two fingers. If it can be squished easily between the fingers, this food is safe for your baby. 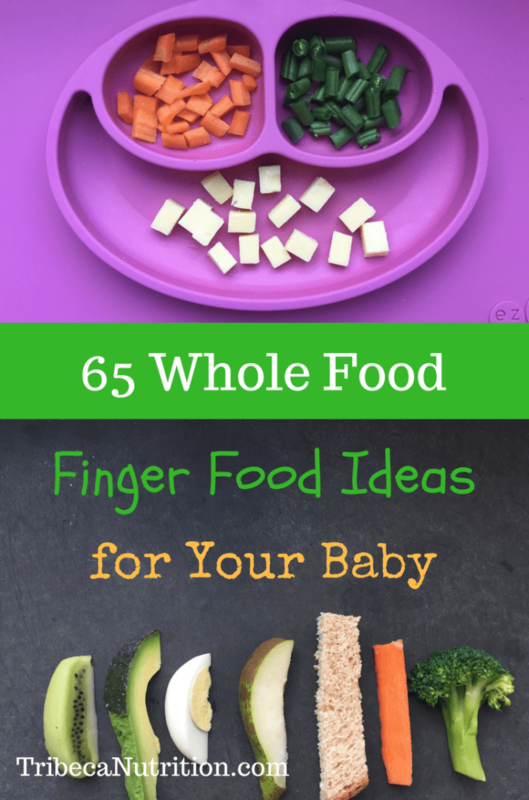 65 whole food finger foods for baby. 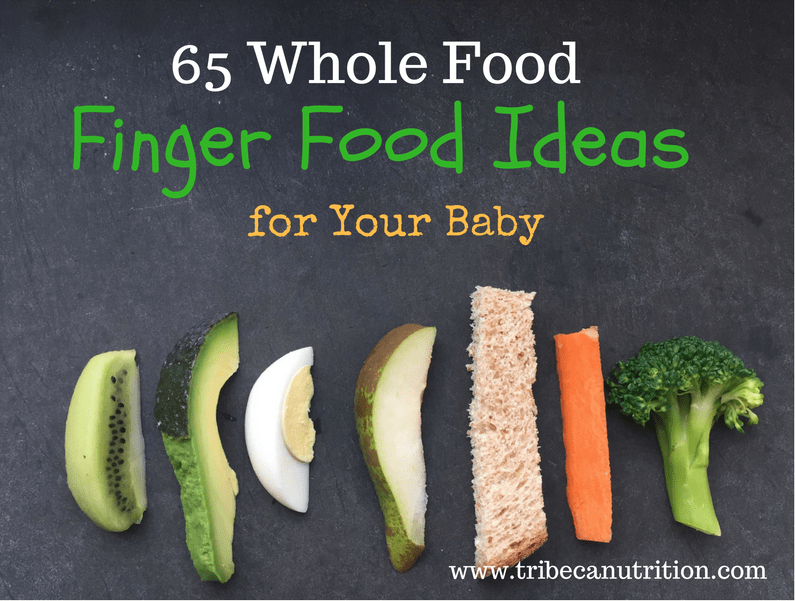 Your baby may be ready to start experimenting with finger foods as early as at 6-7 months. At this stage, he can only use his whole palm to pick up the food. So it is important to cut the food into large disks, large slices or sticks the size of your finger that can be held in a hand comfortably. Too slippery to hold? Wash well and leave the skin partially on for a better grip or dust food with a baby cereal. If you would like more tips, I made a Facebook video on how to cut finger food sot make them less slippery and make easier to hold (including using a special tool I love). By 8-10 months most babies can use their pincer grasp, i.e. their fingers to pick up smaller pieces of food. Finger foods cut into small shapes about the size of a dime will be the best match to their abilities at this point. All the foods from the list below can be cut smaller to allow babies to practice their pincer grasp. 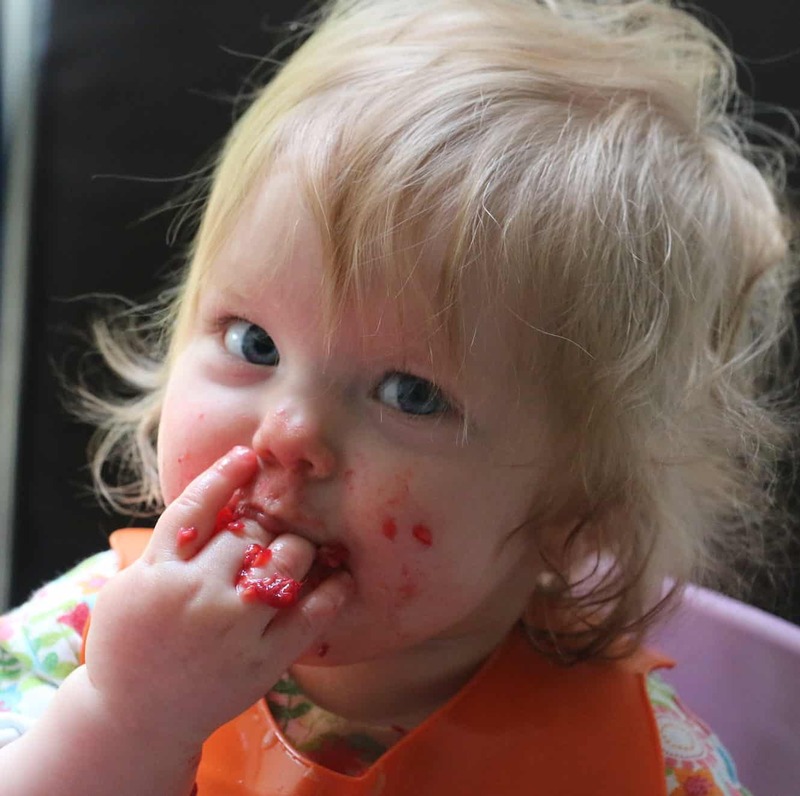 You may be surprised to know that babies are also very good at eating thick purees with their fingers. Thick oatmeal, mashed potatoes or any thick puree will make a perfect (but messy) finger food for your little one. Food that can be shredded like cheese or shaped into balls like sticky rice can also be served as finger foods. To make it easier to print it out or save on your computer, download the pdf here. Need a little more handholding when transitioning your baby to self-feeding and finger foods? Schedule a free one-on-one consultation with me to see how I can help. 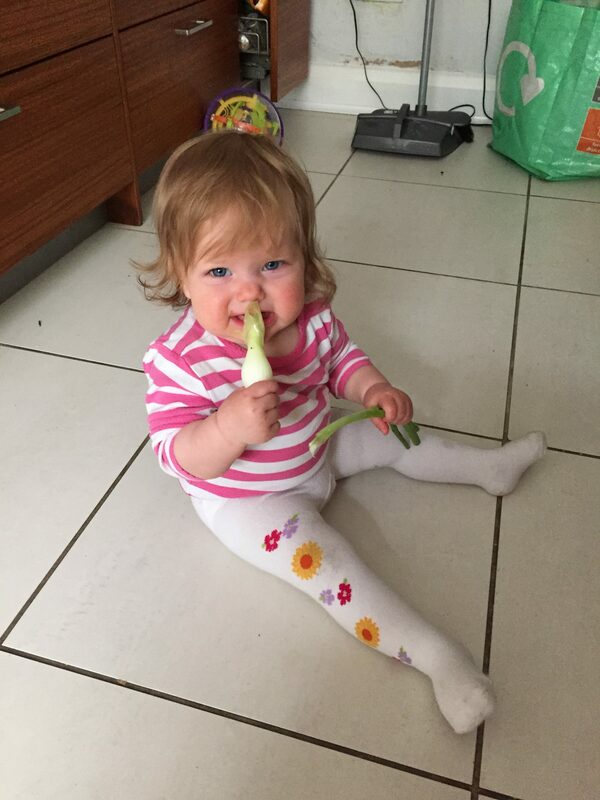 Can I combine baby led weaning and spoon feeding? Would you like me to send you the list in a downloadable format? Great! Please follow this link to download it. Thank you so much for reading! I need al the help I can get!!! Hi Andrea! Thanks so much for stopping by. 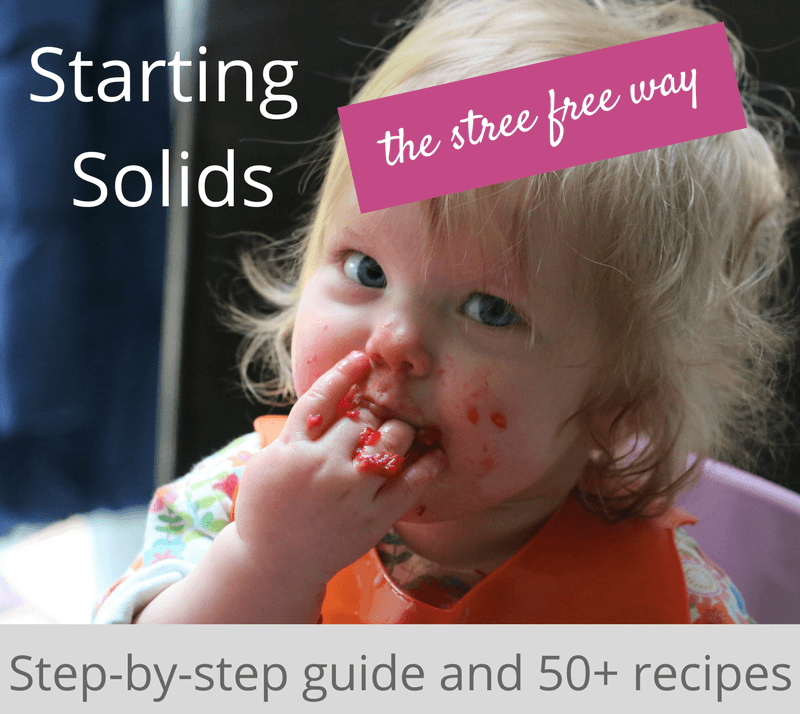 I am working on an e-guide on starting solids and if you are interested, subscribe to get the pdf of this finger food list (use the sign up form above the comments) and I will email you once it is ready. Hi. I’m new to BLW. With regards to the squish test, when is it applicable until? 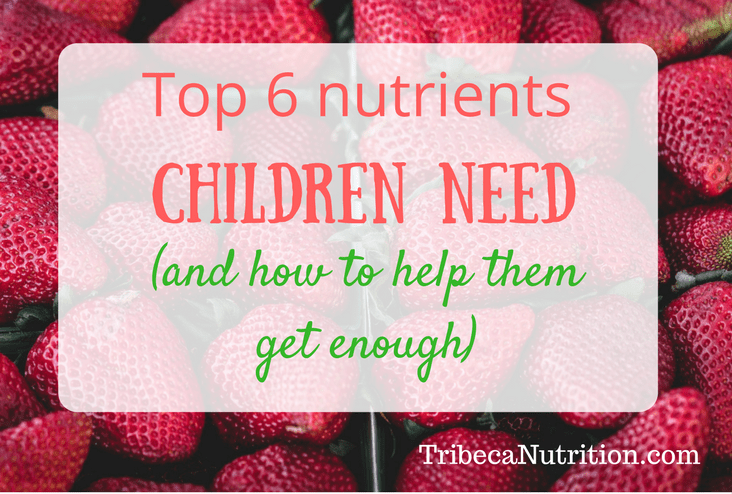 How we know our babies are able to squash the food effectively instead of swallowing down. – E.g. For apples n pears, I steamed tat it will pass the squish test. If raw, it need some significantly more strength to squash it. When can I offer the food raw. – Also, if I want to start meat, e.g. Boiled chicken breast. It’s not squashable to tear off. Can I still let them try to tear it off? Worried that they will “munch” and swallow the entire shreds that they tore off. Thank you so much for your comment and great questions. I will do my best to answer them :). Regarding the squish test. It basically means that YOU can squash the food between the fingers. It is a cautionary measure to ensure that the food we are giving to babies are not too hard. Hard foods that will snap off if yo upend them, like raw apple or carrot sticks, are not appropriate for kids under 3 unless you cut them into matchsticks (very thin sticks) or grate them. So if you would like to serve them raw, safe shape is very important. Pears can be safe in bigger pieces if they are very ripe and pass the squish test. Re meat, I would recommend separating chicken meat ALONGSIDE the grain. This way, it is pretty unlikely that a baby can separate chunks or threads. And it is better to serve chicken leg meat, not breast. It is harder to bite off and it is much softer due to high fat content, so it passes the squish test. And it is higher in iron too which is important at this age. Thank you so much for stopping by Tiana! I wish you and your little one lots of fun feedings and hope to see here you again soon :). If there is anything else you would like to know about, please let me know, I am always looking for new ideas. 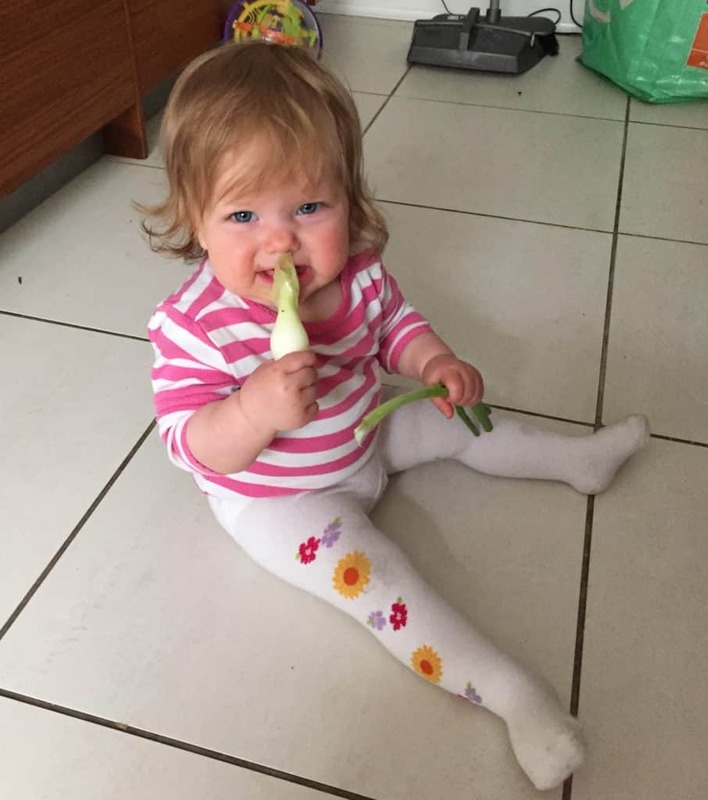 My Daughter loved spring onions when she was very little and it’s not something I ever would have given her but she was very inquisitive and pinched some from my plate when she was about 6 months (this led me to BLW) she’s always had a funny palet (now almost 4) she loves pickled veg, olives, artichokes, anchovies and sushi. My Son however even though raised the same has a very different preference he loves sweet potato, chicken and most fruits so it is so important to give them a safe variety when they are small so they can experience the with food. Hi Cassandra. 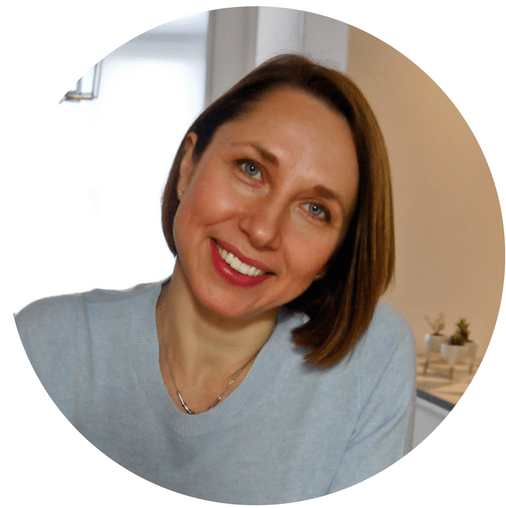 I have 3 kids and they are all so different when it comes to food preferences! One likes savory, another sweet and the toddler is crazy about salads :). I think sensory play is super important for kids so they feel confident around foods with different textures. And yes, throwing food is maddening. I could not wait for this phase to be over! Hi Lauren. Sorry for a delay in reply, I wanted to wait because I knew my eBook was coming out any minute and now it is available for purchase. 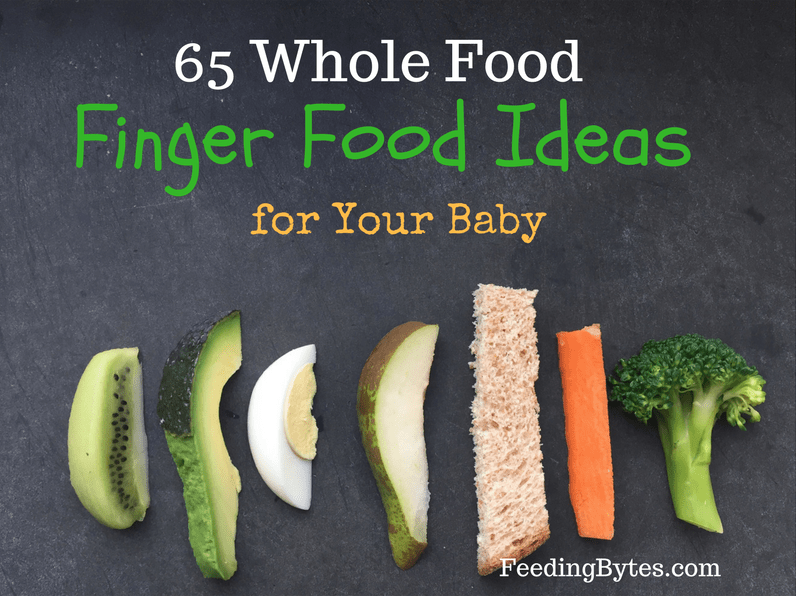 It is answering this very question: how to teach your baby to self feed finger foods in a safe way. You can find out more here:http://tribecanutrition.com/starting-solids-stress-free-way-ebook/. Hope you like what you see! I feel like it is going to be a 100% match for your needs. Believe me, you are not the only parent who feels this way. So many of us are concerned about choking but want our babies to be more independent and keep learning.